Emerging evidence shows that the African Romans raised families in Britain. The remains of an ancient, mysterious skeleton, found here and nicknamed Beachy Head Woman, are put under forensic and isotopic analysis in order to reconstruct her identity. 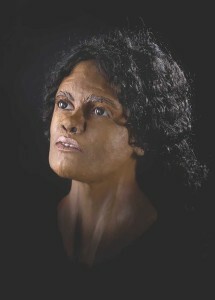 This analysis reveals that she was of African descent yet raised in East Sussex between 200 and 300 AD. Further discussions with Eastbourne Archaeologists suggests her body was discovered close to the village of East Dean. David marks the village’s unique place in black British history with a plaque, which is now on a flint wall opposite the Tiger Inn on East Dean village Green, BN20 0DA.